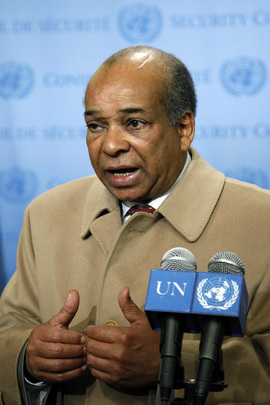 UNITED NATIONS, February 22 -- In the run up to the UN Security Council's closed 3 pm meeting on Libya, the UK is preparing a draft Press Statement, using the name of Ibrahim Al Dabbashi, who denounced Colonel Moammar Gadhafi in a Monday press conference in Libya's Mission to the UN. Meanwhile, Dabbashi's “superior” at the Libyan Mission, Libya's Permanent Representative Abdel-Rahman Shalgam, has sent an e-mail to the Security Council re-asserting his control., sources told Inner City Press. Later, the Brazilian President of the Council told the Press that it is Perm Rep Shalgam who will be speaking. What then of the UK drafted Press Statement? At the day's UN noon briefing, Inner City Press asked Ban Ki-moon's spokesman Martin Nesirky to confirm that Aicha Gadhafi, the Colonel's daughter, is a UN system Goodwill Ambassador. Nesirky, who had not responded to the written question submitted on the morning of February 20, now said that he “understands” that Aicha is a UNDP Goodwill Ambassador in Libya. He would not answer what Ban thinks of or will do about this. 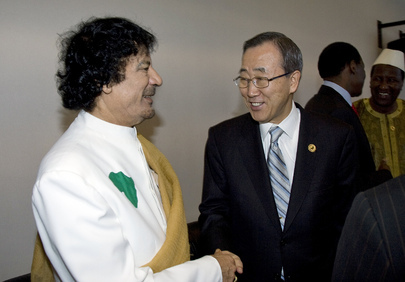 Inner City Press asked Nesirky if the UN is aware of reports, including on Ghanaweb, that Gadhafi is soliciting mercenaries in Ghana, Nigeria and Guinea, or if the UN is looking into this. No and no, Nesirky said. Meanwhile, with Ban Ki-moon away in Hollywood, Deputy Secretary General Asha Rose Migiro is meeting today with Leslie K. Christian, Ghana's outgoing ambassador to the UN. Maybe she'll ask him about mercenary recruitment in Ghana - or about Ghana's position, different from Ban's, on Cote d'Ivoire. Watch this site. At UN, Libyan Deputy Says Mercenaries, PR Shalgam Says No, “Brown Like Me, Gadhafi Is My Friend, He'll Stop in 24 Hours"
UNITED NATIONS, February 22 -- “Gadhafi is my brother, he is a courageous man and can make a decision,” Libya's Permanent Representative Abdel-Rahman Shalgam told the Press Monday morning outside the UN Security Council. Minutes later Shalgam's deputy Ibrahim Dabbashi, who wrote to the Council on Monday asking for an emergency meeting -- and now, a no-fly zone and humanitarian corridor -- said that he will be the one to address the Council on Monday afternoon. “What about Shalgam?” he was asked. “He is in New York but he is not working,” Dabashi said. It's a coup, and a successful one, within Libya's mission to the UN, sources tell Inner City Press. The majority went with Dabashi, who held a press conference in Libya's mission during the US holiday on Monday. Li Baodong of China stopped and told Inner City Press that there may be a Presidential Statement in the afternoon, it is floating around. A Western ambassador insisted Monday morning that Dabashi is the “charge d'affaires” and thus represents Libya. Later, at 10:44 pm, Dabbashi returned to say that if Shalgam reasserts his powers, he will speak. Dabbashi said while Shalgam is Gadhafi's friend, he agrees violence must stop. But Shalgam denies mercenaries, while Dabbashi told Inner City Press they are in use in Tripoli. Footnote: Inner City Press smelled liquor while standing next to Shalgam while he spoke on Monday. Watch this site. UNITED NATIONS, February 22 -- It wasn't clear why the trip was scheduled, and even less clear why it was not canceled after Libya starting bombing peaceful protesters from the air. But Tuesday as the UN Security Council convened behind closed doors on a request for a formal meeting on the bloodbath in Libya, Ban Ki-moon was in Hollywood talking about climate change and Haiti. Would he be asked about the protests against the UN in that country for militarization and, they say, bringing cholera in? Would Don Cheadle ask about how little the UN is saying as Sudan bombs the Jebel Marra region of Darfur? Ban's trip is a faint echo of that of Ambassador Susan Rice, to the headquarters of Twitter. Ban is going to Facebook, moderated by Zuckerberg relative Randi; Ban has appeared in the LA Times, albeit under the name Ki-moon. The CEO of the UN Foundation Kathy Calvin has traveled out there, and the UN's head Washington lobbyist Will Davis. 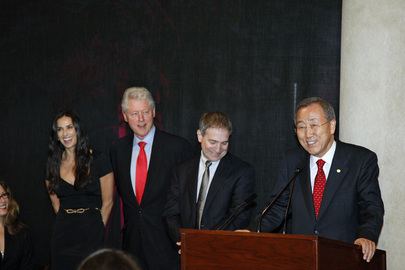 Will they speak about Libya, and Gadhafi's daughter being a UN Goodwill Ambassador with a UN Laissez Passer? The goal is to get UN story lines in the movies. Inner City Press exclusively attended and reported on filming of Transformers 3 in the General Assembly Hall. What will it get for the UN? Two days later, no response at all from the UN. Inner City Press also asked Ban's spokesman Nesirky “in this context, the Secretary-General's planned trip to California to meet and greet 'the entertainment industry,' how much is this trip costing, and is it funded by the Regular Budget of the UN -- and if not, what is the funding source?” Again, no answer. Faceless at Facebook indeed. In Murky UN, Kane & Trezza Look to Geneva, Nairobi Opaque, Zannier to OSCE? UNITED NATIONS, February 19 -- Asked about how told UN jobs are given out, long time UN official David Nabarro on February 19 told Inner City Press, “There are intensive efforts underway in the selection of so many senior positions in our system to increase transparency.” Video here. One wishes that were true. 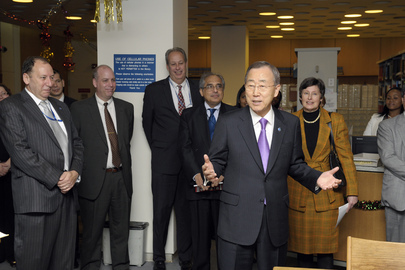 For weeks, Inner City Press has been asking Secretary General Ban Ki-moon's spokesman Martin Nesirky to clarify the status of Under Secretary General Angela Kane, who was one of two finalists to lead the UN Office in Geneva, and to state whether UN envoy to Kosovo Lamberto Zannier gave notice before he put his name in the ring to head the OSCE. Kane's competitor for the Geneva post has been Italian official Carlo Trezza, his country's delegate on disarmament and other topics. On February 19 the buzz was that Trezza and not Kane was getting the post; some said due to corruption scandals and delays in the UMOJA technology program under Kane's watch. Kane has previously told Inner City Press she has no time to answer questions from the press, to send them all to the Office of the Spokesperson for the Secretary General, where dozens of questions are pending, including the unanswered ones about Kane and UN management. But why can't the UN say who are the finalists for jobs, and why? There is for example a new Under Secretary General post at the UN in Nairobi, which was created after UN headquarters unceremoniously removed Tanzanian Anna Tibaijuka from leading that office and put the German Achim Steiner in charge. The African Group fought back and a new management post was created. But who will fill it? Who is even in contention? Watch this site.